Once per turn, Tai Shi Ci can compete with any character. If he wins, he can use an additional attack and each attack has unlimited range and can target an additional player. If Tai Shi Ci loses, he cannot attack that turn. Tai Shi Ci can use "Heaven's Justice" in two different ways: he can use it before Attacking to try to Attack twice with the previously mentioned bonuses, or he can use it after his first Attack, so he can use one additional Attack with the previously mentioned bonuses. If he uses the latter option, the Attack that he uses before the competition does not get any bonuses. The bonuses for "Heaven's Justice" are applied in addition to the effects of the weapon that Tai Shi Ci has equipped. For example, if Tai Shi Ci has the Crossbow, he can Attack as many times as he would like with infinite range and each Attack targeting two characters. Tai Shi Ci can be an offensive powerhouse if he wins the competition for "Heaven's Justice." Characters with only one Escape may not use it on the first Attack if they fear that Tai Shi Ci has Wine for the second Attack. 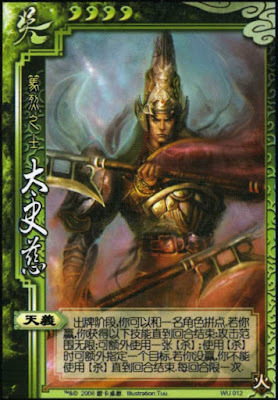 If Tai Shi Ci does not want to use his power two Attack twice, he can still use it at the end of his turn against an enemy to make them discard an additional card. "Heaven's Justice" is expensive. He has to have a card with a high number (Ace through King) so he can win the competition and he also needs two Attacks to maximize the effect of this power. He can quickly find himself out of cards if uses this power too much or in the wrong way. Guo Jia/Xun Yu/Liu Bei/Lu Su - These characters can help Tai Shi Ci by giving him hand cards. Da Qiao - Da Qiao can help Tai Shi Ci a lot because he can target both Da Qiao and someone in her attacking range at the same time with an Attack. Da Qiao can pass her Attack to the other character, so the net effect is that the second target gets attacked twice with one card. Fa Zheng/Sima Yi/Xiahou Dun - These characters have retaliatory abilities that activate on a 'per instance' basis. This can make this process more expensive/damaging for Tai Shi Ci. King Tai Shi Ci is a powerhouse, but he does not make a good king. He has no defensive abilities. Loyalist Tai Shi Ci can be a good loyalist, especially if the king is Liu Bei. Rebel Tai Shi Ci makes a good rebel. If he wins the competition, he can reach the king regardless of his attacking range. Spy This role is not the best for Tai Shi Ci. He needs to have a team to be effective. Once the other players determine that he is the spy, they will probably not support him since they cannot be sure if he will help them. Tai Shi Ci is a very strong offensive character, but he can lose steam quickly. As stated previously, he really needs to have a team in order to be the most effective, preferably one with a hand-refilling character. When using "Heaven's Justice," you need to make the choice as to whether or not will compete with a friend or foe. Competing with a friend will more likely have a favorable result (if they choose a low-numbered card), but this is more expensive for the team. Competing with an enemy will force them to lose a card, but they may have a high-numbered card, which will ruin Tai Shi Ci's plan.